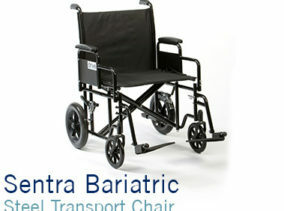 The Sentra EC is a collapsible bariatric wheelchair with a generous 32st (200kg) weight capacity. Available in 20” to 24” seat widths. The Sentra EC offers a versatile, low cost mobility solution. 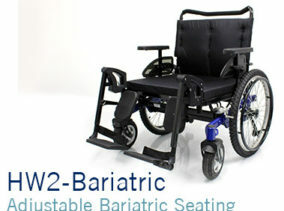 The Heavy duty version features extra wide seat widths and reinforced framework. Available in 26” – 30” seat widths with a higher weight capacity of 318kg (50st). Sentra Classic – with chrome finishes and self-propel wheels. Crash tested* – Suitable for use in a Wheelchair Accessible Vehicle (*20” – 24” versions only). Wipe clean, double embossed vinyl upholstery for durable lightweight support. Tool-free height adjustable, swing-aside footrests for easier transfers. Removable for storage. Available with elevating footrests for users who need to raise their legs. Desk-style arms provide unhindered access to work surfaces and can be removed for side transfers. Maintenance free 20cm (8”) solid front castors with 3 position height adjustment. Attendant and user accessible parking brakes to rear wheels provide additional safety.